A slight departure from strict themed entertainment today. I was talking to one of my friends and we somehow got on the topic of dream houses. Ok, we were hiking in the mountains of LA that are chock full of beautiful houses and we might have been a tad envious. Anyway, I was trying to explain that I’ve always loved the idea of taking themed entertainment and applying it to my house. The idea of having a house where you have one building but depending on where you see it from looks like completely different buildings fills me with so much joy. I also like the idea of having one hidden side of the house looking like the most boring warehouse ever. Plus, there’s so many great styles of architecture and this lets you have more than one and rake in all the benefits of each. 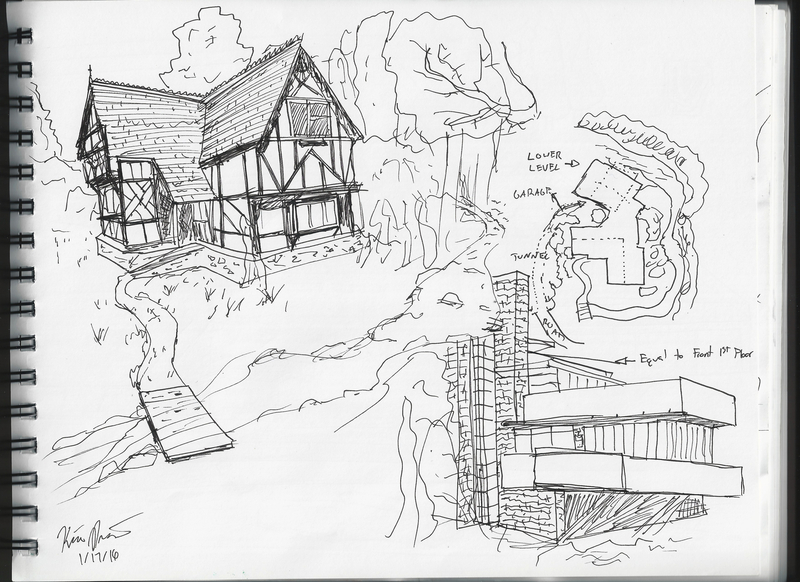 Some of my favorite styles are Tudor and Modern and so when I got home I looked up some examples and came up with a quick sketch of what I was talking about. Ok, so yes it’s probably two really cliche facades, but hey they’re pretty and Falling Water especially is amazing. Also sort of alluded to here is how much I feel landscape design is just as, if not more, important than just the buildings themselves. Actually my main criticism of the Magic Kingdom in Florida is the lack of landscape in most of the park, and the continued deforestation of what remains. 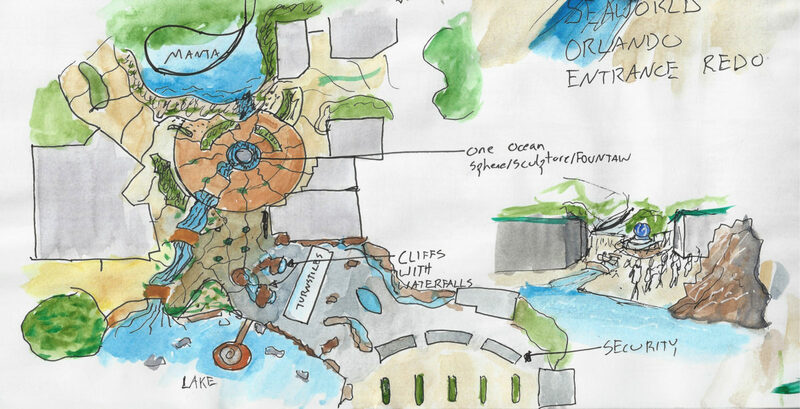 I think it’s actually something that we’ve seen disappearing or taking a backseat to fantastic constructions and massive rock work for a while now.. And nearly all parks could really take more advantage of elevation changes and stacking attractions or areas for much more visual and exploratory interest – but I digresss. I imagine this house nestled somewhat on a hill. Immediately to the left there is a tunnel in the hill that leads towards the garage and “utility” side of the house that’s not visible from the street. The Tudor side with stream and background of large trees faces the street. Then the backside of the house is larger and lower than the front and positioned on an overlook over the water of the stream and/or waterfall that wraps around to the front of the house. Like it? Will someone build it for me? For free? Lol. Thanks for reading and as always I’m always grateful for thoughts and feedback.